D12 Series: Glass Fiber Optic. Range: depends on fiber; Input: 10-30V dc. Output: Complementary NPN. 2 m (6.5 ft) cable. D12 Series: Glass Fiber Optic. Range: depends on fiber; Input: 10-30V dc. Output: Complementary NPN. 6 Inch Pigtail Quick-Disconnect Connector. D12 Series: High Speed Glass Fiber Optic. Range: depends on fiber; Input: 10-30V dc. Output: Complementary NPN. 2 m (6.5 ft) cable. D12 Series: High Speed Glass Fiber Optic. Range: depends on fiber; Input: 10-30V dc. Output: Complementary NPN 20ms pulse stretch. 2 m (6.5 ft) cable. D12 Series: High Speed Glass Fiber Optic. Range: depends on fiber; Input: 10-30V dc. Output: Complementary NPN 20ms pulse stretch. 6 Inch Pigtail Quick-Disconnect Connector. D12 Series: High Speed Glass Fiber Optic. 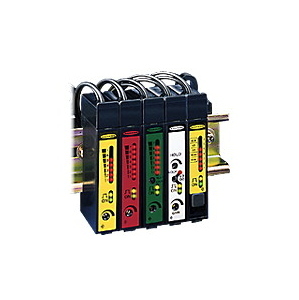 Range: depends on fiber; Input: 10-30V dc. Output: Complementary NPN. 6 Inch Pigtail Quick-Disconnect Connector. D12 Series: Glass Fiber Optic. 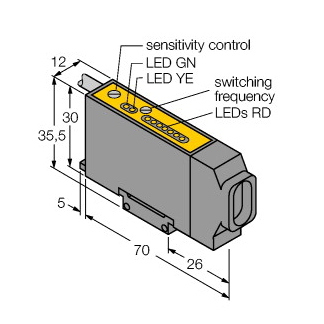 Range: depends on fiber; Input: 10-30V dc. Output: Complementary PNP. 2 m (6.5 ft) cable.